This is really, really easy. Take a couple minutes for chopping and assembly, pop the casserole dish into the oven and dinner will be ready in an hour. In a single dish you will have bites of pork sausage, baked cabbage, and a side of mashed potatoes. Yum! A few posts ago, I shared almost the same recipe, but with grassfed beef. It is crazy how differently the two versions taste, considering how similarly they are prepared. Preheat the oven to 375F. Spray a pyrex dish (approximately 12" x 12") with olive oil. Wash and slice the potatoes and cabbage. Mix the pepper into the ground pork. Mix the tomato sauce, water, and salt together. Place the potatoes into the bottom of the pan. Layer a third of the cabbage on top of the potatoes. 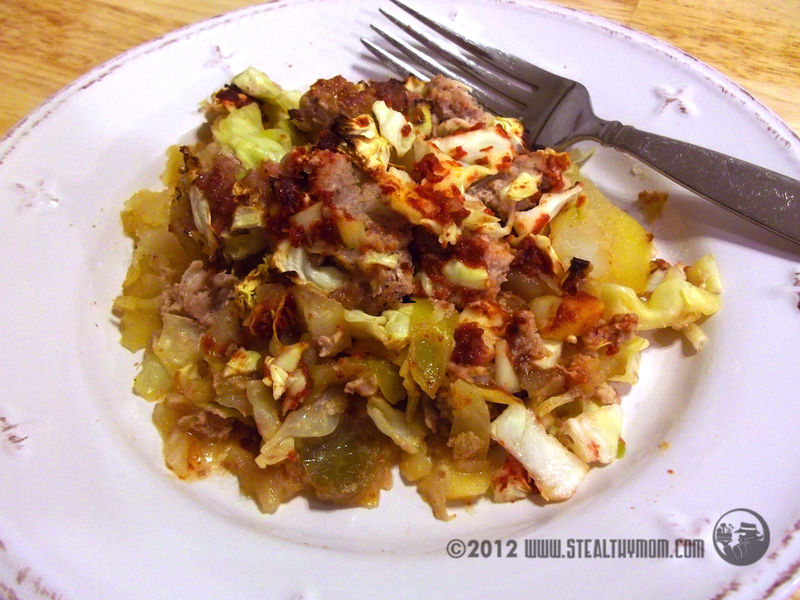 Place half of the pork over the cabbage layer, breaking off bits like little meatballs. Top with a third of the cabbage, the rest of the pork, and the rest of the cabbage. Gently but firmly pack everything down. Pour the tomato sauce over the top. *The trick is to use lean pork from a small farm, not the typical grocery store variety. It will be leaner and not have grease to pour off. I shared this recipe with the Hearth and Soul Hop, Allergy Free Wednesday, Gluten Free Wednesday and Healthy 2Day Wednesday and Simple Lives Thursday. I am on a cabbage kick lately. This looks so hearty and filling - the perfect meal to sit down to after spending hours in sub-zero temperatures removing ice from the horse pens! Thanks! We tried it with purple cabbage last week, and it wasn't very pretty. Sub-zero temps? Brrrr. I bet your horses are looking forward to spring, too. This sounds like perfect winter comfort food. It reminds me of a recipe my late Mom used to make using ground beef, rice and potatoes which was very tasty indeed. I like how you have used cabbage as well. Thank you for sharing this post with the Hearth and Soul hop.